Origin - After assuming the facet of Goddess Siddhidatri, Goddess Parvati started residing inside the center of the Sun to help the Sun to liberate its energy. Hence, that day onwards, the Goddess became Kushmanda. She is known as the Goddess who possesses the power to live inside the Sun. The radiance and glow of her body are as luminous and fiery as the Sun. It is believed that Goddess Kushmanda provides direction and energy to the Sun. Therefore, she is known for ruling the Sun. Goddess Kushmanda is said to be the fourth facet of the mother Goddess and is worshipped on the fourth day of Navratri. 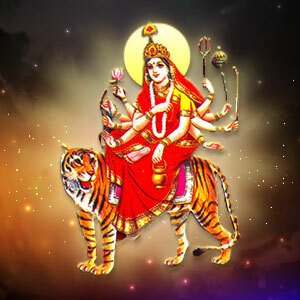 She possesses eight arms, holds weapons and a mala, she mounts on a tiger and emanates a solar aura. ‘Ku’ means ‘a little’, ‘ushma’ means ‘warmth’ and ‘anda’ means ‘the cosmic egg’. Therefore, she is considered to be the creator of the universe. It is thought that the universe was no more than a void full of negativity and darkness until she spread light in all the directions. She is worshipped to gain health, wealth and strength. On this fourth day of Navratri pay reverence to Mata Kushmanda after worshipping the kalash. It will be auspicious to use asana of green color. Offer Water and Flowers to Mata Kushmanda seeking the blessing for good health of self and dear ones. If someone in your home is terminally ill, then seek special blessings from Mata for his/her early recovery. Offer flower, dhoop, gandh etc to revered Devi. Offer the bhog of fruits to Mata Kushmanda as per your capacity. After performing puja pay reverence to the elders of the house and distribute Prasad.